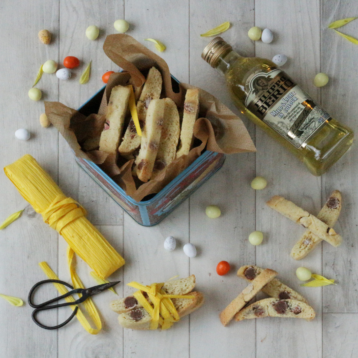 Swap the almonds for Mini Eggs in these traditional Italian biscuits for a real Easter treat! Made with Filippo Berio Mild & Light Olive Oil instead of butter for a subtle flavour with less saturated fat. They make wonderful homemade gifts packaged up in waxed paper or a gift box. You can also use large chocolate chunks or M&Ms, instead of mini eggs, so you can make them anytime of the year. This recipe was shared by 'Ink Sugar Spice' blog. Preheat your oven to 160C fan or 180C conventional (325F). Line two large baking trays with parchment. Mix together the flour, baking powder, salt, eggs, caster sugar, vanilla extract and the olive oil and bring this gooey dough together in the bowl. Now gently mix in the eggs. Cover your worktop/table in a light dusting of flour. Take the mix out of the bowl and divide into two. Shape each piece of dough into a long, slightly flattened log about 6cm wide. Place onto baking trays. Bake for 20 mins until just starting to brown. Take the bakes out of the oven, but do not turn your oven off. Leave the bakes to cool, still sat on their baking trays. After about 10-12 minutes they should be cool enough to slice. Using a sharp knife, cut off 1 cm / 0.5 inch slices and lay them on their sides on the baking trays. Place the sliced biscuits back in the oven. Bake for 8 minutes for a shortbread-like consistency or 12 minutes if you would like hard biscotti to dunk in your coffee. Leave to cool and store in an airtight container for 3-4 days (up to a week if you baked them harder).